recipe. | La Rosilla - Lifestyle and food. I know I’m late to the table, to jump on the ‘Overnight Oats’ bandwagon, never really appealed to me. I can’t do cereal with cold milk, I have to eat it dry I even have butter on my Weetabix when I’m being childlike and need nursery food memories for comfort. Shock horror, I know but I’m sure we all have some weird and wonderful food faux pas. The more I read about the phenomena, I thought I must try this, I have all the ingredients in my store-cupboard. Another fact, I’m not proud to admit, but hey it’s true, my youngest now 14, gets up and leaves the house in the dark (school starts too early here) before I’ve had chance to be bright eyed and bushy tailed, *Mum fail* and I know was grabbing anything to eat that didn’t take up pressure minutes to prepare. So I, we, she, could prepare breakfast the night before, leave in the fridge and hey presto a healthy, vitamin, energy packed pot of goodness would be ready to go. Still, at this stage, I’m thinking cold, gloopy, mushy ……. I investigated all the recipes, ideas online, adapted them to what we had and set about creating our oaty concoction. Kilner jar clean and ready, loaded with ingredients that would supercharge us to Wonder Woman status ( always wanted that costume 😉 ). In the fridge it stood, to work its magic. By soaking the oats all night in your chosen liquid, preserves the tastes and nutritional value from not cooking, a great source of iron and dietary fibre and slow realese energy, keeping you full up till lunch. So this is what I created. What you need: Large Kilner Jay or covered jar, mug to measure ingredients. 1 mug Unsweetened Almond milk – Skimmed milk would work fine too. Mix all together and place in fridge until morning. I then served in a bowl with a scatter of almond nibs and a sprinkle of Bloom Supercharge Matcha. Well, well, well I was so pleasantly surprised it was delicious, thick and creamy almost luxurious. So my thinking cap is on as there are so many adaptations and additions for your basic recipe, you can literally add any fruits, spices, liquids & nuts. What’s your favourite medley ? Please share your ideas. So I hope it won’t be an overnight (excuse the pun) fad, and we start to feel our Wonder Woman powers. 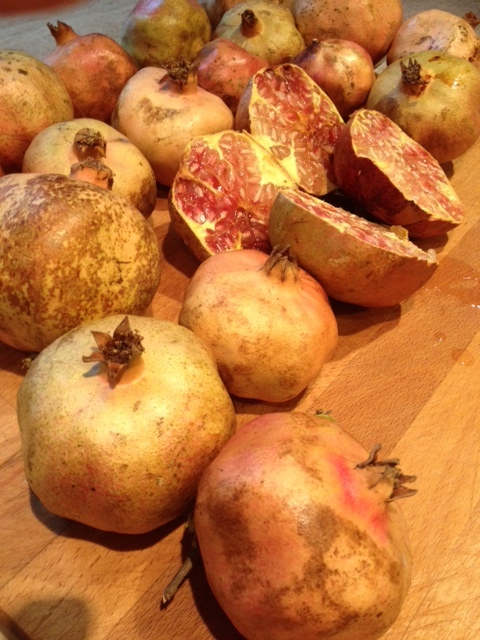 As every year, I’m always delighted when the first Pomegranate is ready or ‘Granada’ as they are called in Spain. They hang dripping from the trees on the mountains. 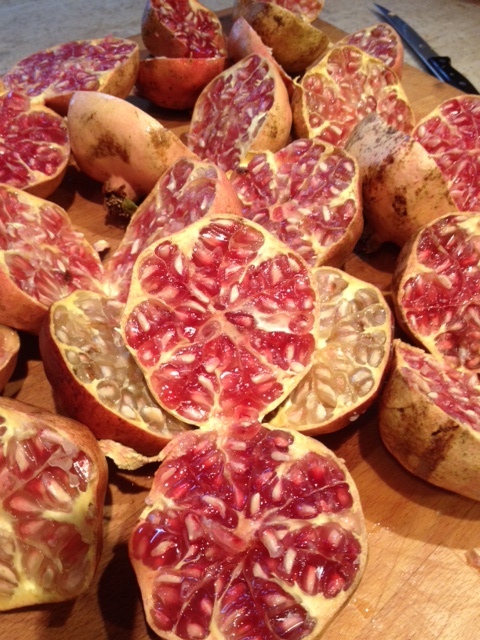 some splitting with their over ripeness, giving a sneaky peak to their ruby-red jewel’s inside. 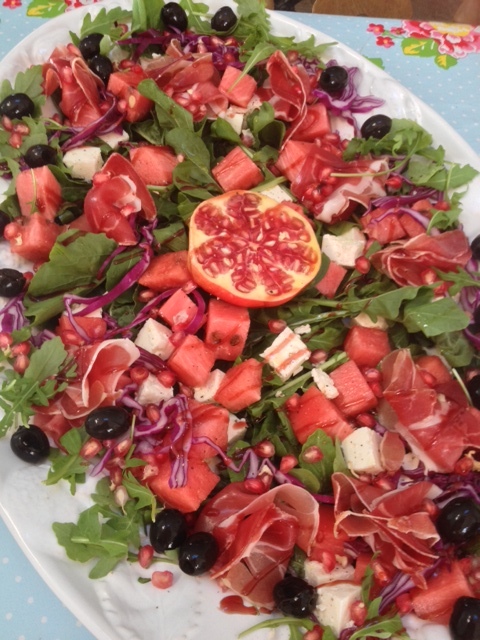 I use them as much as I can when in season, Pom Raita, Pom Punch, Pom Cous Cous , This year I created a lush salad with other fruit and herbs in season, Poms, watermelon, feta, rockets, nuts and local jamon and olives delish ! 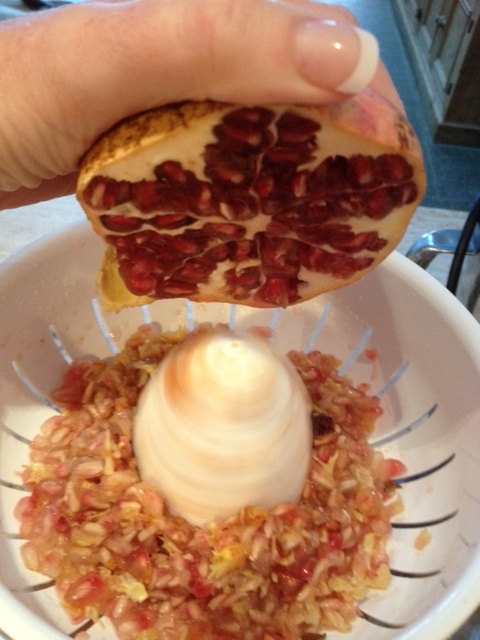 I also went about creating my first Pomegranate Molasses, an ingredient that I use a great deal in Middle Eastern cooking, but surprisingly have never been able to find locally , the results were fabulous. Now I have the ruby spectacular syrup to take me through the winter months. 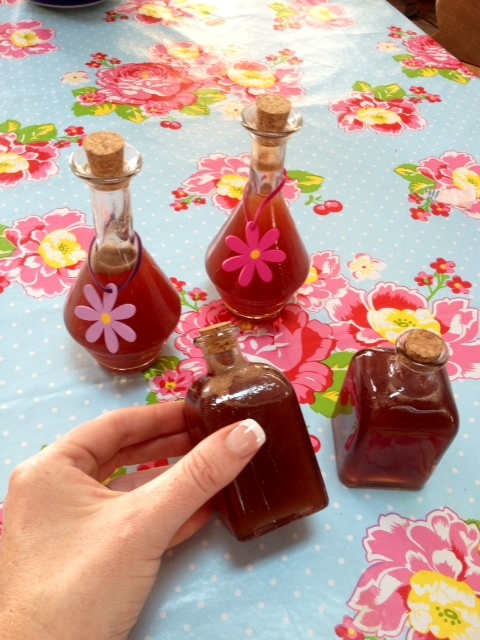 I also jarred cute bottles for friends for ‘C’ just can’t say the word yet, I hope they’re not reading !! Gather as many Poms as you can. 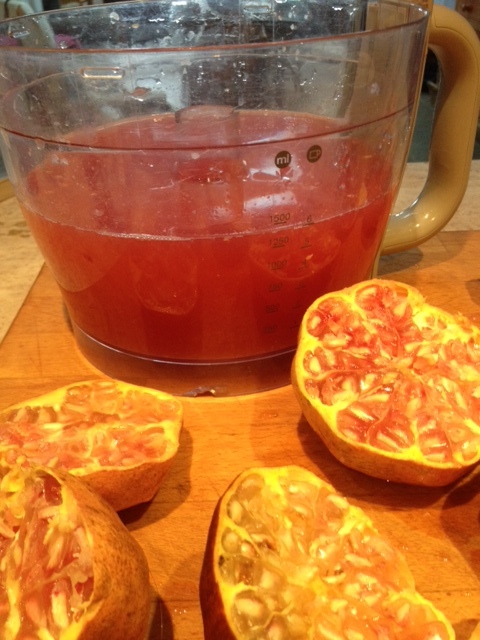 Pomegranate juice, 20 poms makes about 1.5 litres !! Put the juice in a pan, with 2 tbs of sugar and a juice of a lemon, bring to the boil and then simmer uncovered to reduce to a thick pouring consistency, then bottle. Will keep in the fridge for several months. 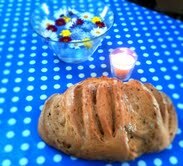 Daily Bread, that would be nice ! Oh how lovely to bake bread every day, In my dream life, that’s what I’d do, but in reality no can do. But I do indulge, when the time allows, and there is nothing more comforting than home made bread fresh out of the oven, the aroma is one of the worlds most favourite smells. I remember 8 years back, when I was selling my house in the U.K freshly baked bread was a more regular occurrence, I’m sure it clinched the sale too 😉 That homely aroma, wafting through the house. Baking bread actually is a simple affair, and nothing to be scared of, very few ingredients often in our cupboards, and even if it doesn’t make the grade on your first attempt it will still taste delicious. Of all the dishes I make my visitors, friends & clients, they always ask ‘Home made bread ?’ I reply ‘Why of course’ ‘How wonderful, aren’t you clever’. To share bread, dipped into Olive oil and a reduced vinegar, or slathered with creamy butter, or topped with a mature cheese, what can be better ? I tend to add to my loaf, what ever I can find growing in the herb garden, or seeds, nuts or dried fruits form the store cupboard. I also make a huge loaf, you can’t beat the wow factor, or divided the dough into two, and freeze one for when time doesn’t allow. 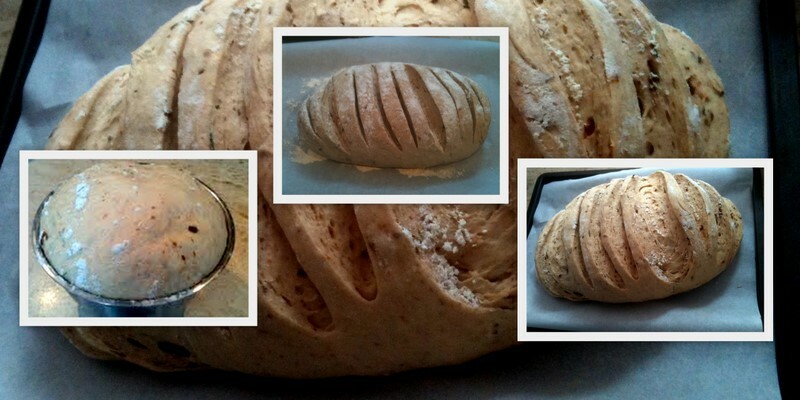 This recipe if for Rosemary & Sun dried Tomato loaf. 1 kg of Strong white bread flour. 560-600 ml of Warm water. 2 Cubes of fresh yeast / or 2 sachets of fast action dried yeast. 1 small hand of rosemary leaves, chopped. 2 tbsp of Sun dried tomatoes drained and chopped roughly. Put flour In a large bowl add salt. Add yeast to the warm water with sugar allow to froth for 10 mins. Make a well in the flour, and slowly add the water & oil, you may not need it all, bring the flour together to make a dough. When the dough come into a ball, take out and knead in the rosemary & tomatoes. Flour a surface and knead, & stretch for 10 mins smooth and elastic. To test if you dough is kneaded enough, press your thumb into the dough and it should spring back, if not knead some more. Lightly oil the large bowl, and place the dough in, cover with a damp cloth, and leave in a warm place to rise, until doubled in size. Approx 45 mins. Once risen, punch the dough down, knead lightly on floured surface & shape into required shape & makes slashes with a sharp knife across the top, this will allow the dough to rise more. Place on a lined baking sheet & cover once more with a damp cloth and allow to rise again. Approx 30 mins. Heat oven to 175 degrees, once up to temperature, put a small oven proof bowl in bottom of oven with water in to create a steamy atmosphere. Add the loaf on the middle shelf, and cook for approx 30 – 4o mins. The Loaf is ready when you tap the base and it sounds hollow. Leave to cool, if you can wait.